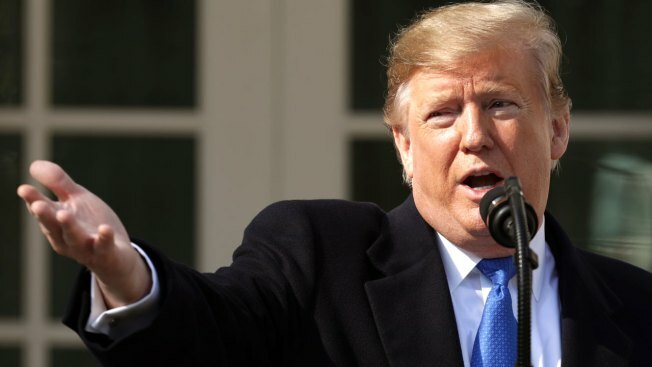 We briefly cover some of the statements the president made in his Feb. 15 Rose Garden remarks — nearly all of which we have debunked numerous times before. The facts: That’s not accurate. The U.S. does not have to release criminals; in fact, it is required to detain certain criminals. Those attempting to enter the U.S. without “valid entry documents” or “by fraud or misrepresentation” must be detained pending an expedited removal proceeding, as explained in a 2018 report by the Congressional Research Service. And they are subject to deportation whether they have a criminal record or not. Now, some people apprehended trying to cross the border illegally (or legally for that matter) may seek asylum in the U.S., a process that can stretch for years in some cases. The immigrant must first get a U.S. official to determine that he or she faces a “credible fear” of prosecution or torture if forced to return home, according to the U.S. Citizenship and Immigration Services. If an asylum officer doesn’t find there’s a credible fear, the immigrant can request a review by an immigration judge. If the judge agrees with the officer, the immigrant can then be removed from the U.S. Even for those who have passed this initial “credible fear” threshold, they still must have a formal asylum hearing, which can take years. But authorities are under no obligation to release those awaiting a long-term removal proceeding. In fact, ICE is required to hold certain criminals, including those who have been convicted of an aggravated felony, those who have multiple criminal convictions, and those who have served more than a year in jail for a criminal offense. That’s spelled out in the Immigration Nationality Act, Section 236 (c). Those apprehended near the border who have committed a less serious offense and who are deemed not to pose a risk to public safety, can be released pending the long-term proceeding. But authorities are not obligated to do so, especially if they are deemed a risk to public safety, Sarah Pierce, a policy analyst at the Migration Policy Institute, told us. “There is no obligation to release anyone,” Pierce said. The facts: Trump is referring to Sayfullo Saipov, a Uzbekistan national who has been charged in a 2017 terrorist attack in New York City that killed eight people and injured 11 others. Trump has repeatedly claimed that Saipov used “chain migration” to bring 22 people with him into the United States. There’s no evidence that Saipov brought even one relative to the country. Saipov came to the U.S. in 2010 through the Diversity Immigrant Visa Program, according to the Department of Homeland Security. As a green card holder, Saipov could not have sponsored anyone other than a spouse and children, and he married in the United States in 2013 — so he could not have been responsible for bringing in the relatives cited by Trump. Saipov’s father and mother — Habibullo Saipov and Muqaddas Saipova — were living in Uzbekistan at the time of the attack, as reported by the Daily Mail and the Wall Street Journal. The facts: The president has repeatedly misrepresented how the Diversity Immigrant Visa Program works. Under the program, the Department of State randomly selects up to 50,000 qualified applicants from countries with low rates of immigration to the United States. Contrary to Trump’s claim, countries do not “put in people” for visas; the individuals themselves apply. And those selected in the “lottery,” as Trump calls it, must pass an extensive background check before they are given green cards, or legal permanent resident status. There are more than a dozen grounds of inadmissibility, including health issues, criminal activity, national security concerns and the “likelihood of becoming a public charge,” meaning “a person who is primarily dependent on the government for subsistence.” That’s all done in an attempt to prevent “very bad people,” as Trump called them, from getting into the country. The facts: The Drug Enforcement Administration — not just “certain Democrats” — say that Mexican cartels “transport the bulk of their drugs over the Southwest Border through ports of entry (POEs) using passenger vehicles or tractor trailers.” This is particularly true for heroin and fentanyl — two opioids that Trump mentioned in his remarks. According to U.S. Customs and Border Protection drug seizure statistics for fiscal year 2018, which ended Sept. 30, 2018, 90 percent of heroin seizures occurred at legal ports of entry in the first 11 months and 80 percent of fentanyl in the first 10 months. “A small percentage of all heroin seized by CBP along the land border was between Ports of Entry,” the DEA said in its 2018 National Drug Threat Assessment. Last month, U.S. Customs and Border Protection made the largest fentanyl bust in its history when a Mexican national “attempted to enter the United States through the Port of Nogales.” Border agents discovered nearly 254 pounds of fentanyl worth about $3.5 million “concealed within a special floor compartment of a trailer that was laden with cucumbers.” Trump has been making this claim since 2017 and, most recently, in this month’s State of the Union address. The facts: There’s no data on how many are smuggled illegally across the border with Mexico for human trafficking, as we said in our story when Trump made a similar claim in his State of the Union address. But experts told us legal ports are the typical mode of entry in the bulk of the cases they deal with concerning foreign nationals. A spokesperson for Polaris, which operates the National Human Trafficking Hotline, told us “the vast majority of people are coming through legal ports of entry.” That’s based on statistics the group has compiled from the calls it receives through the hotline. In addition, the United Nations’ International Organization on Migration has found that “nearly 80% of international human trafficking journeys cross through official border points, such as airports and land border control points,” based on 10 years’ worth of cases on which the IOM has assisted. The facts: The White House has sought as much as $25 billion for the wall, and U.S. Customs and Border Protection has estimated that it will cost $18 billion in the first 10 years of construction. The president has made the claim — which we have debunked on many occasions — that the revenue generated from the United States-Mexico-Canada Agreement, or USMCA, will indirectly pay for the wall. But the White House has provided no analysis to support the president’s claim, and trade experts we interviewed said it’s not possible. The facts: Despite the president’s claim that he has “already done a lot of the wall,” very little new fencing has been constructed, and none of it is the type Trump promised during the campaign. As we have written, Congress last year approved $1.6 billion to replace existing barriers and add some fencing in new areas. But Congress stated that the money can only be used to build “operationally effective designs deployed as of the date of the Consolidated Appropriations Act, 2017, [May 5, 2017] such as currently deployed steel bollard designs, that prioritize agent safety.” That language prohibits the administration from building any of the wall prototypes that the administration had designed and that the president toured last year in California. Although the administration says the $1.6 billion appropriated last year will fund 100 miles of “wall,” we calculated that there would be about 40 miles of new barriers, which have yet to be completed, while the rest is for upgrades to existing barriers. And the 100 miles of barriers is far short of the 722 miles of new and replacement barriers that the administration has said it plans to build. The facts: Trump continues to peddle the false claim that construction of a fence in El Paso transformed the border city from one of the most dangerous in the country to one of the safest. Those from El Paso in the crowd may have agreed with the president, but as we have written, crime statistics from the FBI contradict the president’s narrative. El Paso has never been one of the most dangerous cities in the country. The city had the third lowest violent crime rate among 35 U.S. cities with a population over 500,000 in 2005, 2006 and 2007 – before construction of 57 miles of fencing started in the El Paso sector in mid-2008. Nor was there an “immediate” or “overnight” drop in violent crime in El Paso after the fence was constructed, as the president has said. In fact, the city’s violent crime rate increased 5.5 percent from 2007 to 2010 — the years before and after construction of the fence, which began in mid-2008 and was completed in mid-2009. Looking from 2006 to 2011 — two years before the fence construction began and two years after it was finished — the violent crime rate increased about 9.6 percent. The facts: There were 1,247 murders in Juarez, Mexico, in 2018, according to El Diario, while just across the border, El Paso police reported 23 murders. But that’s not evidence that “walls work.” While there has long been a high number of murders in Juarez, the number of murders in El Paso has remained relatively low among U.S. cities, both before and after the fence. In 2007, the year before construction of the fence began, there were 336 homicides in Juarez compared with 17 in the city of El Paso. In 2008, a war between drug cartels in Juarez sent the number of homicides in the Mexican city soaring to 2,570. Yet across the border in the city of El Paso, the number of homicides remained at 17, according to the FBI’s Uniform Crime Reporting Program. In 2010, the year after the fence was completed, the number of homicides dropped to 5 in El Paso, before climbing back up to 16 in 2011 and 23 in 2012. Most recently, the city of El Paso recorded 17 homicides in 2016 and 19 in 2017. Those figures are in line with those before the fence went up. The city averaged 15.2 homicides a year in the five years between 2003 and 2007. The facts: Trump made this same misleading claim at a rally in El Paso, Texas, this week. It’s true that the monthly goods and services trade deficit was $49.3 billion in November, down $6.4 billion from $55.7 billion in October, according to Bureau of Economic Analysis figures. But the October trade deficit was the highest monthly deficit in 10 years. Also, the November monthly figure was still higher than it was at the same point in 2017 and 2016. Overall, the trade deficit is up 20.3 percent for the 12 months ending in November, compared with 2016, the year before Trump took office. The facts: Trump has been exaggerating the U.S. trade deficit with China since the 2016 election. The goods-and-services trade deficit with China averaged almost $222 billion between 1999 and 2017, according to BEA data. The deficit with China was $275 billion through the first three quarters of 2018, which is the most recent BEA data available.